Kartify is a Shopify App which allows you to enhance your Shopify store’s cart page. Did you know that on average, the cart page is the 2nd most visited page of any ecommerce website? This is because customers add products to their basket and may often visit this page multiple times in any session. Here is the biggest shock. Most store owners neglect their cart page. It is a generic page in most ecommerce websites with the usual functions and thats it. Kartify is versatile Cart Page App with multiple functions. Editing the cart page on a shopify store usually requires the store owner to make liquid or CSS changes in order to achieve a desired result. With Kartify, the app has been designed without the need for the store owner to code any changes to the cart page. For example lets look at the 3rd one, “Incentivise a checkout with a coupon code”. Most new shopify store owners don’t look at their store’s Analytics. One of the biggest leaks for any Shopify store is when a potential customer adds items to their cart but doesn’t go on to checkout. Kartify can help dramatically improve the conversion rate and push more customers to checkout. 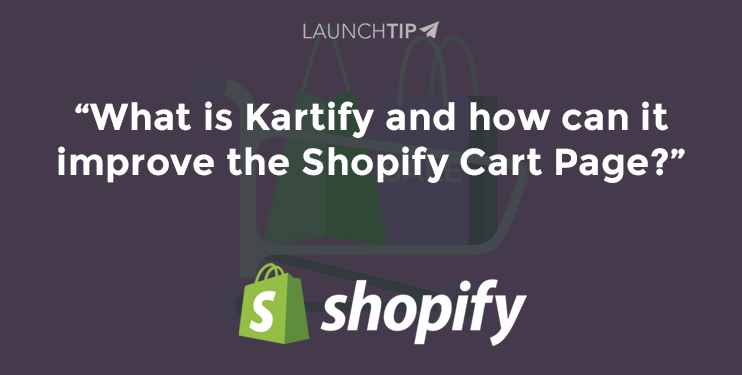 You can setup a discount code in Shopify and display it on the cart page with Kartify to incentivise potential customers to actually checkout. Kartify comes with a 7 day free trial and is available in the Shopify App Store. It starts off at just $4.99 a month (Pricing here) and is one of the few apps on the Shopify store that actually pays for itself with additional sales it can help you to capture in your store.